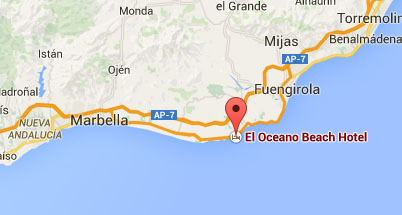 Christmas & New Year at El Oceano Hotel & Restaurant between Marbella and La Cala de Mijas on Spain’s Costa del Sol. Christmas and New Year are always utterly excellent events at El Oceano! We cater for parties too! Christmas Holiday? You Deserve It! Christmas at El Oceano is a very special time! One of our annual highlights, Christmas and New Year are always VERY popular. Winter on the Costa del Sol is a wonderful time. The weather is generally really good with temperatures hovering around 12-15ºC and rain isn’t too likely – we’ve had guests swimming the pool in December! While you will find plenty of holiday makers escaping the colder climate of northern Europe, the crowds are nothing like the high season. What better place to spend Christmas or New Year? Maybe both! If you’re thinking you might deserve a Christmas break, now is the time to start looking. If you’re thinking about Christmas in the Costa del Sol’s finest beach hotel, get in touch! Enjoy the elegance of our beach hotel for your perfect Christmas holiday. A holiday accompanied by an exquisite menu in our beautiful restaurant, accompanied by live party entertainment and the best service on the Costa del Sol. Our newly redecorated accommodation is some of the best you’ll find here! We all need a little sunshine now and again and, during the long winter months of northern Europe, Spain’s beautiful Costa del Sol offers sunshine almost every day, plus a relaxed and tranquil atmosphere after the ‘madness’ of the Summer months. Around Christmas and New Year, we do get rather busy, but the less-busy times usually are from the beginning of November, up to around the 20th of December. November is a great time of year to visit! No crowds, no towels on the sun loungers, prices are a little ‘easier’, all making November a marvelous month for a relaxing winter break. The weather is pretty good too! Clearly not as warm as the summer months, but we’ve seen many winter visitors in the pools – and the sea – well into December! Check the weather averages. Christmas is celebrated slightly differently here. Of course the traditional Christmas Day celebrations are intact, but more emphasis is put on “3 Kings Day”, which in 2020 will fall on Monday January 6th. ‘La Fiesta de Los Reyes’ (The Party of the Kings), or 3 Kings Day is what a Brit might call Epiphany.